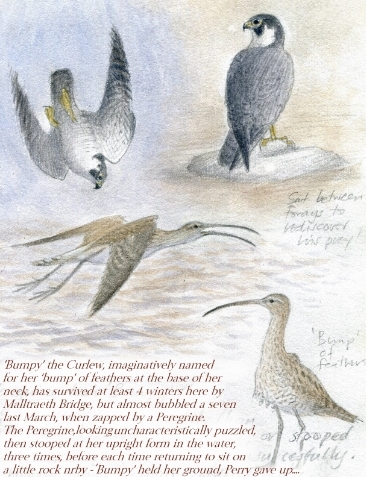 Philip is a wildlife artist and illustrator, here he writes (and draws) charmingly about an old curlew that visits the estuary outside his window in Anglesey every winter. Curlews are rather special birds for several reasons, so it was rather sobering to hear of the reason and need for Mary Colwell’s walk. As that great practical philosopher of Lurve & Loss, Joni Mitchell sang, ‘You don’t know what you’ve got till it’s gone’…. Ironically, having ‘wintering’ Curlews outside my estuary window for much of the year – including a rather special one – I hadn’t realised the full extent of their breeding decline in Britain. Therefore, knowing Mary was calling in on her way past, I was keen to show we still had some, at least one or two?! Well, it turns out I can only actually point to one pair breeding near here, on the RSPB Malltraeth Marsh reserve, alongside that other charismatic and much threatened wader, the Lapwing, and possibly only because Red Foxes are kept out by kilometres of electric fences! What a sad but prognostic state of affairs…. Anyway, back to painting Curlews: firstly, they present a bit of a challenge with their unique form. That distinctive bill is not uniformly decurved, nor each mandible equally shaped, especially when open – yet the sight of one, open-billed, bubbling above its traditional ‘Ffrith’ [transitional mountain-side, or moor] habitat is to many of us the very essence of Curlew-ness. ‘The Soul of the Moor’, ‘the Melancholy Whaup’, and the like. All very ‘Romantic’ and anthropomorphic, but beautiful for all that….yet my very ‘own’ Curlew is far more prosaic, if heroic! ‘Bumpy’, somewhat unimaginatively named for a unique bump of feathers on her back, at the base of the neck, has been claiming the few hundred yards ofestuary shore here by Malltraeth Bridge for at least 4 winters, and very pugnacious about it, too! That could well be why she survived a massive assault on her person, in February, 2015, when a Peregrine suddenly decided the thousands of Lapwings he was stooping through were far too flighty – and so zapped ‘Bumpy’, abruptly revealed beneath the scattering flock – and knocked her down into the river! It’s a good job I managed to record most of the performance that followed, on sketchpad and video, because I’ve never seen anything like it. The Peregrine whizzed off to sit on a rock not 40 yards away, only to look somewhat comically and confusedly around, as if thinking, ‘Where’s that durned Curlew?’ ‘Bumpy’, meanwhile, decided to remain standing in the shallows, rigid, whilst the falcon proceeded – no less than 3 times – to circle above and stoop at her, before breaking off to return to its rock, and look around, perplexed, sometimes for several minutes on end. ‘Bumpy’ continued to hold her ground - terrified? - merely bobbing down each time the falcon violently beat the air about her head, before assuming her upright stance, never leaving the water. It was the falcon that finally gave up, some 12 long minutes later. It reminded me of several Peregrine kills or stoops here, with the falcon often reluctant to take prey like Redshank or Teal off the ground or water, and that the hunted often escape, as with many another predator. ‘Bumpy’, happily still in one piece, left here as usual sometime in March, unfortunately before Mary arrived, but I hope to be able to report her return sometime this summer – and shall be taking more careful note of the hundreds of Curlew that winter here – and hopefully the few remaining breeders. The sad fact is that like most of the thousands of wintering waders & wildfowl throughout Britain, they are not ‘ours’, but probably breeding far further north, even in the sub-Arctic. ‘Bring back the Bubble’! PS: ‘Bumpy’, amongst some dozen other Curlew, returned here in the last week in June, lookinga bit ragged – has she bred up at the nearby RSPB Malltraeth Marsh, and possibly failed? – but otherwise appeared the same, if the ‘bump’ looks a little larger. Viva Bumpy & all her Kin! © Philip Snow, Malltraeth, Anglesey N Wales, 5/2016. In TV documentary and movie making, one of the key techniques in the director’s repertoire is something called the “pull focus shot.” It relies on a large depth of field between two images which can be several hundred feet apart. The camera lens cannot have both images simultaneously in focus, so the cameraman would normally have the foreground image in sharp relief, with the background blurred. As the focus changes, we lose the foreground to a mazy blur as the distance becomes the object of attention. I’m not sentimental about nature, but I do wonder why this simple pleasure at doing a small amount to sustain local creatures gives me such pleasure, such deep satisfaction? It’s as though it connects me to something beyond myself, that puts my own meagre small life into some grander perspective. And these are “mere” common or garden small birds that have nothing of the curlew’s uniquely haunting physical characteristics. The bulldozers will soon be moving in, in greater quantity in the months ahead on the site opposite. The “northern powerhouse” seems to contain next to no plans for greener spaces in Manchester. I just hope that my visitors keep coming. There’s still plenty in the birdfeed budget. I have sculpted so many birds over the past 20 years. My first subject, back in 1997, was the Curlew. Not least because I love the elegance and grace of the bird, and the long beak can be cast in bronze successfully... important for me as my long billed curlew has a very long beak! My other inspiration for my first Curlew was Audubon’s birds of America. His naïve style has influenced my own. I have been lucky to have access to Audubon’s Elephant Folio, an amazing experience to behold, as very few people possess these. I continue to sculpt Curlews to this day; they lend themselves to many elegant and interesting poses. I feel sad that Ireland, particularly, has a much endangered native population. I commend Mary for raising awareness of this worrying issue to us here in Ireland. It was a privilage to meet her and spend some time with her when she was here. Is an ornithologist, musician and composer, using birdsong for inspiration. A Guardian article about him is here. I asked Peter why we find the call of the curlew so beautiful - here is his reply. The evocative, far carrying song of the curlew is a much-loved declining feature of our uplands and wetlands, as well as along the coast. Perhaps because of the lonely, wind-swept nature of its haunts, many people associate the song with a minor key. In fact, if we slow the song down it is noticeably aligned with the major triad-as is the rich call of another of our declining waders, the lapwing. Imagine this sound sequence coursing out across vast expanses of remote landscape, descriptive of air or water waves and currents; an axis is found and propelled upwards and outwards to a climax of internally wavering repetitions. In musical terms, two initial rising glissandi scroll out, winding and winging their way upwards, progressing through a hint of spread dominant 7th, settling into the major triadic axis of several repetitions with a centrepiece of wavering 2-note oscillations. With advancing repetitions, there is a sense of winding back down. The pitch falls and the volume fades back into the silent landscape. At a quarter speed this song could be reproduced on various musical instruments that can bend and vibrate pitch, such as bowed strings, trombone, clarinet, sax or ocarina. 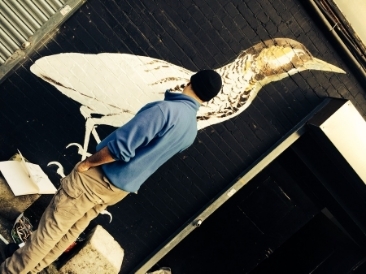 ATM is a street artist specialising in wildlife, especially birds. His striking paintings of endangered birds appear throughout London in unexpected places - powerful images of the wild in urban landscapes. Here is a Guardian article about him. 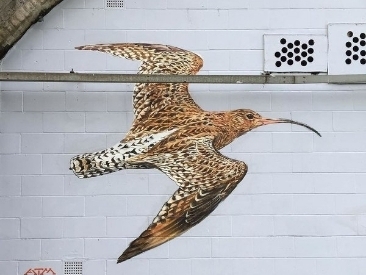 In April he painted curlews in East London. The curlew for me embodies the wild, bracing air of the hills and moors. Its magical call resonates around the valleys and bogs, infusing the peatlands, wild grasses and open sky with its presence. I painted these beautiful elegant birds at endangered13, on an urban wall, because I wanted to communicate their value to others and help inspire a change in the way we treat the land. Our farming practices don't have to be so draconian that they eliminate almost all other species. I only wish I could paint the curlew's haunting, majestic call so that people who have never heard it before could experience the thrill. Brett Westwood is a writer, radio presenter and naturalist. He presents Natural Histories on Radio 4, has recently compiled a book on the wildlife of the Wyre Forest and co-authored the book of the Radio 4 series, Tweet of the Day. For most people, I imagine the call of the curlew summons memories of bleak uplands or wild estuaries. But when I hear it I’m tugged back forty years to a huge open-air sewage farm in the West Midlands. I was fifteen and a birdwatching beginner, viewing his neighbourhood through new eyes and battered binoculars. Suddenly, species I’d only seen in field guides were revealing themselves. Fieldfares chak-chakked in local hedgerows and exotic red-legged partridges chugged like steam trains from fence-posts. It was a time of delicious, unprecedented discovery and my notebooks quickly filled up. To make sense of this doorstep cornucopia I joined the West Midlands Bird Club which covered the counties of Worcestershire, Warwickshire and Staffordshire. The first annual report I received contained an account of “The Birds of Whittington Sewage Farm”, a large area of pasture in the Stour Valley west of Stourbridge, where raw sewage was pumped onto the fields over a square mile or more. The resulting mulch was rich in worms and other invertebrates and didn’t freeze in hard winters which, said the article, explained why it held the only wintering flock of curlews in the West Midlands. I didn’t quite believe that this spectacular wader which I’d only seen before on mudflats and in mountains could be just a few miles from home. Despite my scepticism, an expedition was irresistible and so on December 6 1975, I cycled out to look for the birds. There were few public footpaths and access wasn’t easy, so some slightly illegal manoeuvres were needed to obtain views of the fields, crusted with dried sewage and dotted with nettle-clumps. After an hour or so’s scanning, I heard a fluting whistle and traced it to a flock of large brown white-rumped birds circling over the pasture. In my notebook, written up dutifully that evening, they appeared as CURLEW (20). Bar the upper case letters, it was a remarkably restrained response to what was my most exciting local birding sighting so far. Who’d have thought it -curlews, within a few minutes bike-ride? Marching forward together they probed the turf forensically with scythe-like bills, and all I could do was drink it in. In this tamed landscape they seemed as out of place as a lion in the local park. From then on Whittington Sewage Farm became a regular haunt, and as well as hosting curlews, was visited by over a thousand lapwings and wisps of up to 250 snipe, figures unimaginable nowadays. So inspired was I by the curlews that forty years on the area is still my local patch, though the birds have long gone. The old methods of sewage-spreading stopped in the mid 1980s when a new high-tech plant was built. Now a fly-over curlew, maybe once every two years, is all I can hope for. When I walk the deserted fields it’s hard to credit those teenage memories of wheeling flocks and mournful cries, fading out much like the birds themselves. But the evidence is there in my battered 1975 notebook; eight characters which still evoke so many feelings - CURLEW(20). I’m holding a curlew’s egg. It is a museum egg: blown, empty and quite old. It reminds me of my boyhood, when, in the Washburn Valley my birding friends and I found curlew nests each spring, and gawped in amazement at those remarkable pointed eggs. I remember fixing my gaze on the four eggs arranged with their pointed-ends lying tidily together at the nest centre, while overhead the anxious parents uttered their alarm calls. We remained at the nest just long enough to confirm the eggs’ presence and absorb their image at the back of eyes. Along with many other waders, the curlew lays pointed eggs. The eggs are large relative to the female’s body, but by fitting neatly together in a foursome the incubating parent can cover the clutch and warm the eggs more efficiently. Birds’ eggs come in a range of shapes, and pointed eggs, like those of the curlew are referred to as being ‘pyriform’ or pear-shaped. I’ve never been very convinced by the terminology, and ‘pointed’ seems to do just as well. Guillemot eggs are also said to be pyriform in shape. Unlike guillemot eggs, which come is a vast array of ground colours and types of marking, curlew eggs are much more muted; greens and browns that match the moorland or grassland habitat on which this species breeds. The eggs are camouflaged, providing essential protection from predators such as foxes and crows. Intriguingly, William Hewitson author of one of the first books on oology- published in 1831 – has little to say about the curlew’s eggs, other than that they ‘differ a good deal in the depth of the ground colour and … number of spots’ but quite a lot to say about the bird’s aura. ‘ I have never traversed the lone wild heath, deserted, except by the feathered race, and at a moment in which I have felt the solitary dreariness of the scene, that wild cry of the curlew, so much in accordance with all around me, has not come like the voice of a companion’. That’s exactly how I feel too. The moors near where I live in Sheffield are, during the winter, the embodiment of solitary dreariness, yet in February when the curlew return it islike a reunion. Suddenly, the moors are alive with the sight and sound of birds; aerial displays and song: skylarks, meadow pipits, snipe, lapwing and above all else, the curlew. Mary dedicates her walk to a bird – the curlew – and she explains it through a myth – the story of St Beuno. Here’s a riddle for her to think about and perhaps keep her going on the way. Is a myth more like a snowball, a comet or a mirror? We’ll come back to that, if you’d like to be brooding on it meanwhile. But let’s start with the bird itself. Why would a curlew attract myths anyway? I can scarcely believe the curlew has joined the red list of endangered birds in Britain. It’s as if all one’s best friends were being rounded up and gathered together in a small cell for the condemned: the turtle dove, spotted flycatcher, skylark, cuckoo, lapwing … and now the curlew. When I started birding as a boy, tramping around the Essex coasts, the curlew was my signature bird of the mudflats and marshes. I’d see huge flocks of them spread round the estuaries in winter and I’d watch their restless movements in the passage seasons of spring and autumn, rising in loose cloudy flocks and calling from the skies. There was a careless abundance about their presence that one took for granted then, wrongly so, it turns out. But what made curlews really special was the voice, of course, which I now hear as poignant as well as thrilling. In his classic book of 1927 called The Charm of Birds, Edward Grey (formerly the British Foreign Secretary and one politician who really knew and cared about birds) wrote, ‘To listen to curlews on a bright, clear April day, with the fullness of spring still in anticipation, is one of the best experiences a lover of birds can have. On a still day one can almost feel the air vibrating with the blessed sound.’ Mary will be hearing that sound as she travels. And it’s the voice that gave the curlew its common names in most languages: Dutch wulp, Italian chiurlo, French courlis, and so on to the English curlew, which is reflected in a number of its dialectal folknames too cawdy mawdy, courlie, whaup, wailer, whistler, whitterick. I especially like whaup, a northern variant that evokes the curlew’s war-whoop, usually heard before it is seen over the wild spaces of moorland and fell. The scientific name highlights a different feature. Numenius arquatacombines a Greek and a Latin element, both with the same connotations. Numenius comes from the Greek, meaning ‘like a new moon’, a reference to the crescent shape of the long decurved bill, while arquata in Latin means ‘shaped like a bow’, which is a similar idea. I like the thought of a ‘New Moon’ bird. I see that Mary is starting out on a full moon (officially full on 22 April) and will pass through all its phases, enjoying a new moon on Friday 6 May. I hope she hears the New Moon bird that evening, as a reminder of cyclical change and renewal. And with such metaphorical reminders and symbols we are getting nearer to myths and their meanings. Myths can be messy and confusing, hence my riddle at the start. The St Beuno story gives us a healing, life-enhancing image of the curlew, which is why he gave the bird his blessing and sought to protect it. But the bird is also associated with doom and dread. The ‘Seven Whistlers’ fly at night, portending death or danger. An old Highland prayer begs for one ‘to be saved from witches, warlocks and aw lang-nebbed things’. This lang-nebbed [long-beaked] whaup was also a goblin that moved around under the eaves of your house at night. These are myths that have become snowballs, gathering size and picking up bits and pieces from other folklores as they roll through the ages. No one can stop them to construct them more neatly or make them internally consistent, as we would scientific theories. But they also flare brightly in our imaginations, like a comet streaking across the sky in a blaze, trailing its comet’s tail of vaguer associations, memories and intimations. Most of all, though, they are mirrors. The twelfth-century theologian and poet, Alain de Lille, remarked, ‘Every creature in the world is for us like a book, a picture and a mirror’. We see ourselves and our situations mirrored and reflected in the animals around us. This can play out in crude forms of sentimentality or anthropomorphism, of course, if we make the mistake of projecting human emotions, capacities and values on to creatures of a quite different kind. But as the famous French anthropologist, Lévi-Strauss pointed out, animals can also be ‘good to think with’. The point of many animal myths, fables, allegories and metaphors is to use animals to see things in ourselves we might need to discover and recognize. This can be very liberating and illuminating, but we shouldn’t assume that we can extract literal truths from these other forms of speech or translate them back into more transparent descriptions without remainder. Nor should we assume that in this case the myths are just false. We often use the English word ‘myth’ in a pejorative sense to mean ‘false belief’, but the original meaning of muthos in Greek is simply ‘story’. The stories may be revealing or otherwise, but they are not just true or false. So Mary should take this assorted bundle of stories with her in her spiritual luggage, use them as she will and add to them if she can. She will deepen our understanding and appreciation of this charismatic bird in doing so and will also, we hope, enhance its prospects for survival. Ah, ‘charismatic’, there’s another good Greek word. It means ‘touched with grace’. An old friend's son, when he was about 8, was excluded from school for a while for insisting that his father had had his eye pecked out by a curlew in the garden. Now every time the family, out walking on the north Norfolk coast, spot a curlew, they all wordlessly clamp a hand to their eye. Rabbi Jonathan Wittenberg is Rabbi of the New North London Synagogue in Finchley. In 2010 he walked from Frankfurt to Finchley and his book Walking with the Light tells the story of his journey and reflections. The Hebrew Bible is full of descriptions of the songs, flights and idiosyncrasies of birds. Perhaps this is because the thin stretch of the Land of Israel on the Mediterranean coast offers an essential place to pause and recuperate on the long migrations between Africa, Asia and Europe. The second bird to be mentioned by name, after the raven which flew back and forth until the waters of the flood had dried up, is the dove which Noah tenderly released from his hand. Finding ‘no resting for the sole of her foot’ she returned to the ark in the evening. The homeless dove soon became a symbol for the Jewish People in its wanderings from land to land throughout the millennia of its Diaspora existence. It makes a fitting emblem, too, for all those birds which, exhausted from their vast migrations, find that their habitats and nesting grounds are gone, built over, plowed under, turned into semi-barren, songless acreage. The Bible forbids taking a mother bird for food alongside her young. She must first be sent away; only then may the eggs be taken. (Deuteronomy 22:6-7) The RSPB would rightly find such legislation inadequate today when many species of birds are on the cusp of extinction and the eggs of rare species are sometimes watched for 24 hours each day to prevent poaching. Yet as early as the mid-thirteenth century, the Bible commentator Nachmanides observed that the purpose of this law is ‘so that we should not have a cruel heart and fail to show pity. Or because Scripture does not permit the rooting out of an entire kind, and taking the eggs or the young alongside the mother represents destroying the species…’ Evidently, extinction was a foreseeable threat even then. He prayeth best who loveth best / All creatures great and small. The wings of a bird form an image of protection in the Hebrew Bible and in Jewish worship. ‘Shelter us beneath the shadow of your wings,’ runs the night-time prayer. I only really understood what this meant when I was once privileged to watch a group of cygnets climb onto their mother’s back and hide beneath her feathers. May the wonder and beauty of this world, and all who cherish them, find protection beneath the shadow of God’s wings. What do you most treasure? What would you want to rescue if, God forbid, your home was on fire? For me, an album of photos would bring back a thousand memories. Or the diary that I found recently that traces six months of my life some twenty years ago. It surprised me; I had forgotten those people, that meal, that opinion I held, that story, those voices. The years concertina and for a few moments I was back there, living it again, at least in part. Memories of the gentle touch, the first kiss, the long goodbye, the kindly word of advice. These are the things I treasure. Some I've written down, as if by the very act of writing them down I can hold something of their texture, colour and warmth. Words about love and care, compassion and freedom, re-build long forgotten stories. I've also done that sometimes as a result of time I try to spend in the silence of prayer and the prayer of silence before God. In doing so I've followed in a long line of fellow pilgrims, sojourners on the way, who have also articulated in limiting words the texture, colour and warmth of God. Perhaps these are like the thoughts, experiences and memories that St Bueno had written into the margins of his prayer book. A treasured book containing favourite prayers and sermons, verses and memories; woven fragments of his faith that made him whole. Jesus reflects, “For where your treasure is, there your heart will be also”. The Curlew knew that for St Beuno his book of prayers, his personal record of his conversations with God, were his source of treasure. In receiving the sodden book back, carried by the Curlew from amongst the rocks on the seashore, so Beuno was re-connected, re-equipped, and re-sourced with the source and equipping connection of his life; the God in whom he lived and moved and had his very being. So what does the story of St Beuno and the Curlew ask of us? For me, it sends me back to Jesus’ reflection to ask a where question and a what question. Where's my treasure? What do I most value? St Beuno, whilst glad to have received his precious book, goes beyond the material to thank God for the bearer of his treasure. In doing so he recognises that all that God can do is to go on being gloriously creative. This story pushes me beyond the material to offer my own faltering thankful praise for the song of the Curlew; one of the many treasures of God’s creation. In its call, evocative of our moors and estuaries, the Curlew calls out its own line in the great chorus of creation that ultimately sings, “Holy, holy, holy, Lord God of hosts, heaven and earth are full of your glory”. If its song was no more so the hymn of creation’s praise would be depleted, even mournful, and less than God intended. In bringing us it’s treasured call, the Curlew reminds us to join with the rest of creation in that ceaseless song of praise.